This is the first bench that has been designed by me. It is the Cerullo and Cole Number One and can only be purchased through Cerullo Watch Repair. It has been custom built with a solid maple top, routed along the edge to prevent parts from rolling away. 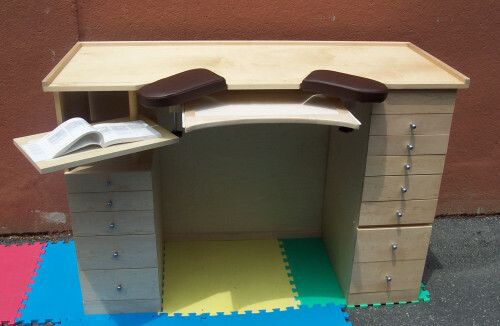 The special ergonomic shape prevents fatigue at the bench and makes it really easy to work on. The sides are maple plywood. The arm rests are adjustable, upholstered in vinyl and padded to keep you really comfortable. 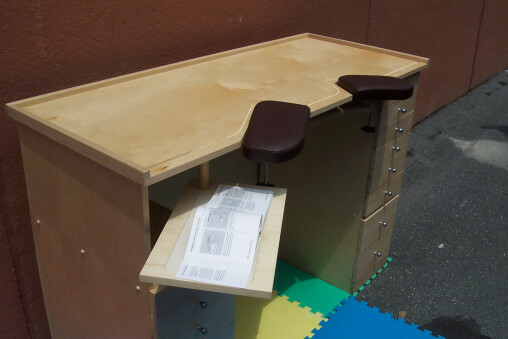 There are two banks of drawers and a special swing out "desk top" so you can put your technical documents, or a book right there to assist you in your work. 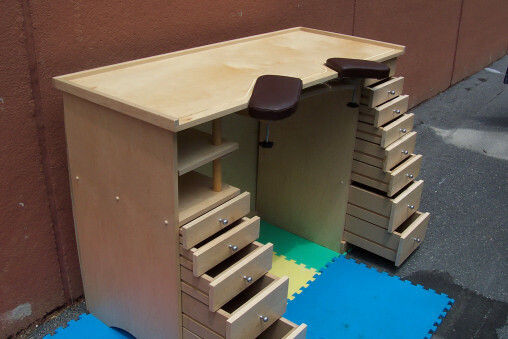 It is positioned so all you have to do is look down for easy reference and you don't need to keep anything on the top of the bench other than your work. This part can be removed and in its place you can put your staking set. The goal was to keep that nice bench top clear of clutter, and that alone will improve any watchmaker's work. Two big banks of drawers with solid maple fronts with nice modern aluminum pulls give it a modern look while improving function. There is an apron that pulls out in the front of the bench and it is placed in a higher position on this bench. That alone improves the functioning of this feature and changes it from a catch all junk collector to a catcher and saver of errant parts. Changes can be made on an individual basis. We have planned to sell this bench for $1400, but we will be offering this model bench for $1299 for IHC members and for the National at York. If you would like to have any more info on the bench, just email me or post here and I will get right back to you. We can make delivery or shipping arrangements for anywhere, so let us know and we can give you a price quote. Here are the dimensions and features. We made this bench as big as the Swiss ones and it makes working a joy. In the immortal words of Emily Latella, "Nevermind". I was contacted by Mr. Cerullo, but he's put this project on the back burner for the time being. In the interim I found another solution.